Robin is a singer-songwriter from NYC whose music is a mix of folk, pop, rock, blues, country and jazz. She calls her music "Acousticness." Imagine a female James Taylor; strong finger-picking, rootsy songs with sophisticated pop influences. Stong soulful singing and memorable original songs make a lasting impact on her audiences. Her songs have been recorded on Fast Folk and Atlantic Records. She was picked for a finalist spot at the prestigious Kerrville Folk Festival Songwriting competition (1989) in Texas on her very first application. Robin was also signed to Bob Dylan's publishing company as a writer for two years. She has performed in over 44 states and several countries including The Dominican Republic, The Bahamas, China, Japan, Mexico, Germany, Switzerland, Holland and Denmark. She is a Club Med performing artist. Robin performed extensively for college audiences across the U.S.for two decades in addition to playing at various folk venues. Her first album "SLOW BURN" was released initially as an independent in 1989. It was subsequently picked up for release in Europe by Swiss label BRAMBUS Records in 1992 and received rave reviews. Robin did her first European tour in 1994 and has part of every summer for the rest of that decade touring Europe, especially Denmark. 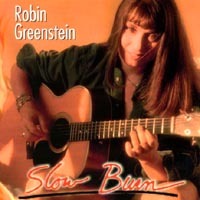 In 1997 Band Together Records re-released SLOW BURN on CD in the USA. 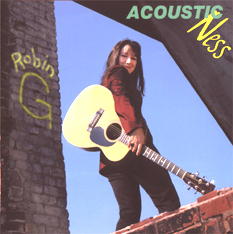 Robin's second CD "Acousticness" was released in 2000. 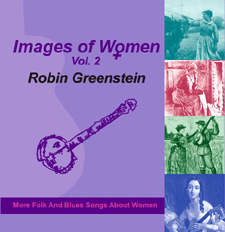 Her third CD "Images of Women", released in 2002, was the first in a series of volumes which explore traditional folk and blues songs about women. Vol. 2 was released in 2010 and made the Grammys first ballot for traditional Folk Album of the Year. At the end of 2010, Robin released "Songs of the Season", a CD featuring music from an annual show she performed with Long Island musician Cecilia Kirtland. Robin has won music competitions at the Riverbank/Walden Radio Folk Festival and the NJ Folk Festival, South Florida Folk Festival and others. She's showcased at both the Falcon Ridge Folk Festival, Kerrville Folk Festival the NJ Folk Festival, The Napa Folk Festival and many Folk Alliance Conferences. But her favorite gig all time was singing the national anthem at Madison Square Garden in NYC for her beloved New York Knicks! Robin plays both guitar and banjo. Her superb musicianship, powerful songs, strong singing and relaxed performing style win over audiences everywhere. She majored in Music at SUNY-Stony Brook with a concentration in Classical Guitar). Describing her music as "Acousticness", Robin mixes many styles of music - folk, pop, rock, jazz and blues- in an acoustic base. In a show, you might hear a jazz standard, a blues song, or a instrumental banjo dance tune scattered among her original compositions. Her music has the musical sophistication of James Taylor with the lyrical sensitivity of Joni Mitchell, and strong vocals like Linda Ronstadt or blues-influenced like Bonnie Raitt. Robin does a concert-lecture entitled "Images of Women," a look at women's lives thru traditional Anglo and Afro-American folk songs, as well as family and children's programs (see "Other Shows"). She is eligible for Meet The Composer grants as well as BOCES. She was a performer-clinician for Martin Guitars and teaches privately in the New York City area when she's not on the road (lessons in guitar, banjo, uke and voice). 1989 - "Slow Burn", debut album first released on Windy Records. at Holland Village, outside Nagasaki, Japan. 1998 - Showcase, NACA and APCA conventions; "Montel Williams" show. Slow Burn re-released in USA on Band Together Records. Featured in the video HOW TO GET THE GIGS THAT PAY BIG BUCKS. 2000 - New CD "Acousticness" released. Begins working with Martin Guitars. 2001 - Begins working as a Headline Entertainer for the Renaissance Cruise Line. 2002 - Performs in China with Martin Guitars. 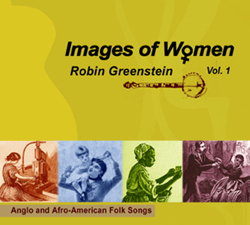 2003 - New CD "Images of Women", featuring traditional Anglo and Afro-American folksongs; released. 2008 - Returns to Japan to perform as part of the Hiroshima Initiative, a series of peace concerts to commemorate Universal Peace Day. 2010 - New CD "Images of Women, Vol. 2" released - makes first ballot for the 2010 Grammy Awards in "Best Traditional Folk" category. "Songs of the Season" holiday CD released end November. for the month of September on the Folk DJ Charts.
" Songs of the Season" - (CD) A multi-cultural holiday music CD featuing songs from Christmas, Chanukah, Kwanzaa, Yule and New Years. Performed by Robin Greenstein and Cecilia Kirtland with other musical guests. Sung in English, Spanish, Hebrew, Ladino, Yiddish, German, Swedish and Yoruban. "Slow Burn" - (LP, cassette and CD). Brambus Records outside the U.S, Band Together Records and Windy Records in the U.S.
Robin's debut CD.The LP and cassette version have 10 songs; (9 original, 1 cover); the CD has 14 songs (12 original, 2 covers). A collection of mostly original music with full backing band on most track, featuring ace NY session musicians. Two covers: "Bye Bye Blackbird" and "Someone to Watch Over Me", both done acoustically. "Art Is A Language" - (CD and cassette) Music for the young at heart. Includes 2 original songs, traditional banjo tunes and contemporary children's music. Production includes guitar, banjo, fiddle, bass, and assorted special sound effects. Windy Records.